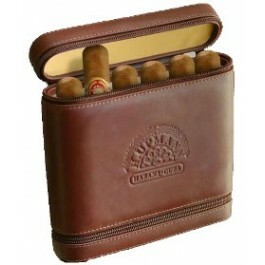 The H.Upmann Travel Humidor packs 6 marvelous light-medium bodied Robustos in a leather travel size humidor, 4.9” (125mm) long, of 50 ring gauge. The H. Upmann Travel Humidor comes with six cigars in the Robusto size (50 ring gauge and 124 mm long) – a first for the H. Upmann brand. Robustos will only be available in this latest exclusive for the travel retail channel. 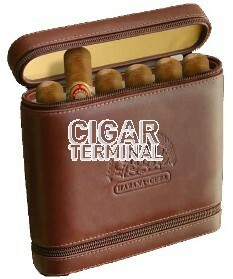 The lightweight and compact humidor comes wrapped in genuine leather with the iron-stamped brand logo on the side. Cigars are firmly adjusted within the wooden mould and protected against humidity, temperature changes, and sudden movements. The lower zipper of the case grants access to the humidifier located at the bottom so the user can get the sponge moistened.